During the process of commissioning and annual quality assurance of a linear accelerator, different dose (ionization) profiles must be measured and given as inputs into the treatment planning systems. ,, Current linear accelerators have different modalities and energies,  which makes the commissioning of the machines a time consuming process. , Water tanks with remote control arms are widely available in the radiation therapy community, and medical physicists are able to set several desired depths to measure the dose profiles sequentially. The water tanks are usually large enough to give the possibility of measuring fields as large as 40 cm. The medical physicist has the options to select among different arm speeds (for measuring the dose profiles and depth doses, and which can be performed), spatial resolutions, and measurement times. One may set the system in a way that, after measuring each dose profile, the scanner returns to the starting point to start a new profile measurement at a new depth. However, movement of the arm (during or before measurements) generates unwanted water surface waves with different amplitudes. The maximum amplitude of these surface waves is usually not larger than a few millimeters. A very simple measurement can be carried out by a ruler taped on the edge of a water tank. 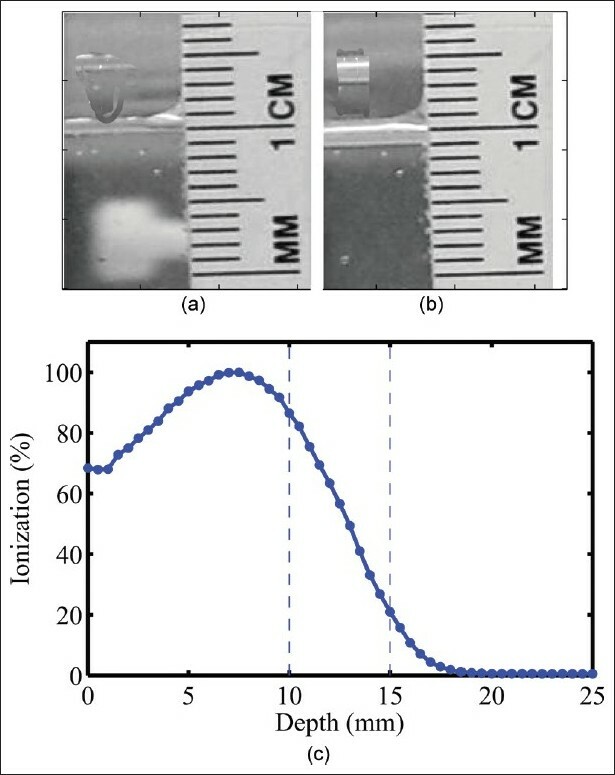 In [Figure 1]a and b, we have shown a typical simple measurement demonstrating a wave amplitude of about 1 mm. These waves may affect the measurements in regions where the percent depth dose (PDD) changes quickly. For example, in [Figure 1]c, we have shown the PDD for a 10×10 cm 2 , 4 MeV electron beam (without applicator). The PDD curves drop almost 65% within a short distance of 5 mm (from 10 mm to 15 mm). The wave amplitudes of 1 mm can cause a water displacement of up to 2 mm over the detector (e.g., ionization chamber). In this paper, we investigate the effect of the speed of the arms on the accuracy of the measurements. This effect depends on integration times in the detector, too. For the results presented in this manuscript, the dwell time is about 0.3 ms which is nearly instantaneous. Dose profile measurements were taken using MEPHYSTO mc 2 software and a PTW water tank (50 cm×50 cm×40 cm) filled with water. The detector is attached to a variable speed movable arm that moves in a Cartesian coordinate system. The arm speed in different experiments was 1, 5, 10, 20, and 50 mm/s. The dose collection time was 0.3 ms, and the spatial resolution was selected to be 2.5 mm. The dose collection time is long enough to prevent the confusion between the random uncertainty introduced by noise to signal ratio and the systematic effect of waves on the dose measurements. Dose profiles were measured for 4 MeV electron beam with no applicator (jaw opening 10 cm×10 cm). The measurements were carried out at R50 = 12.9 mm. Two sets of experiments were carried out: I) after each dose profile measurement, the arm was left at the end point. For starting a new profile, the arm returned to the starting point and immediately began acquiring the new dose profile; and II) after each measurement, the arm was immediately returned to the starting point and the next profile measurements were started with a delay of about 5 min. 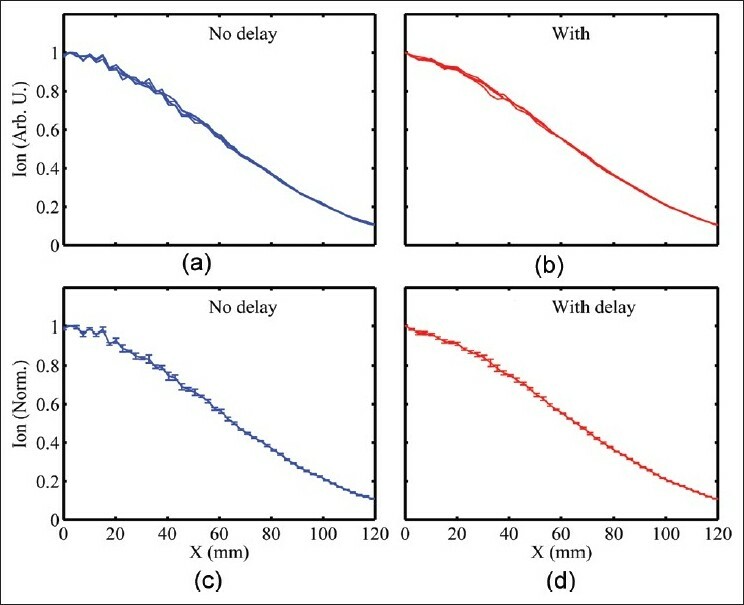 In this paper, we adopt the term no-delay for the cases when a measurement starts immediately, and the term with delay for those cases when the arms are returned to a starting point and measurements are resumed after water waves are damped. A diode E type 60012 (from PTW) was used to measure the charge. The sensitive area of the diode is 0.03 mm 3 and the radius of sensitive volume is 0.6 mm. Due to symmetry of the dose profiles, only half of the profiles were studied. While it is acceptable for the present study to only test the half profile, one of the most important tasks of profile measurements is the very assessment of symmetry which is assumed to be acceptable here. Each measurement was repeated 3 or 4 times in order to study the reproducibility. The direction of the arm movement was from x = 0 to x = 120. In [Figure 2], the dose profiles of 4 MeV beams in the water phantom are shown. The field size is 10 cm × 10 cm with no applicator. The measurement depth was at Rp~12.9 mm. The no-delay measured curves [Figure 2]a show some weak reproducibility with large fluctuations during the first half of the measurements. With delay [Figure 2]b to allow for wave damping, reproducibility is greater and fluctuations have lower amplitude. The average of the dose profiles and associated standard deviations were calculated. 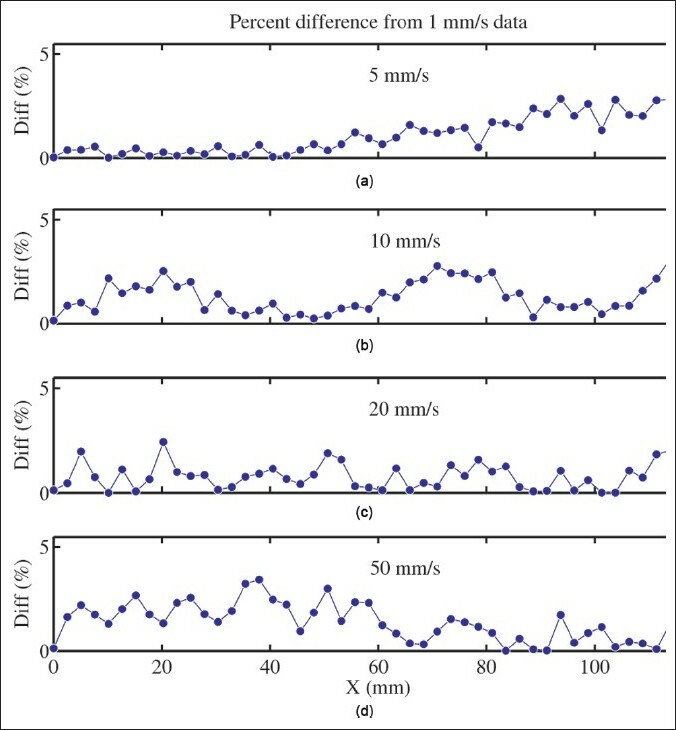 The waveforms for an arm speed of 50 mm/s are shown in [Figure 2]c and d. The error bars in no-delay cases [Figure 2]c are larger compared to the dose profiles with delay [Figure 2]d.
The standard deviation of the measurements is given in [Figure 3] for arm speeds of 1 and 50 mm/s. 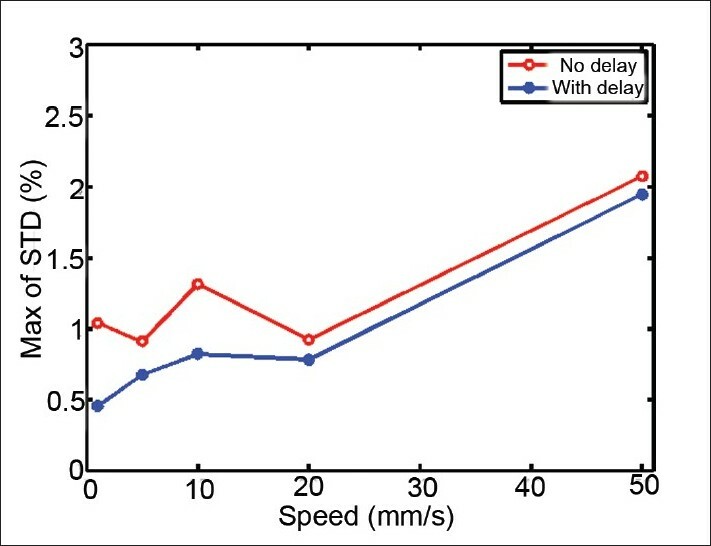 The standard deviation is low at 1 mm/s arm speed [Figure 4]a whilst, at 50 mm/s, the error initially increases and then decreases over elapsed time [Figure 3]b. A summary of the maximum standard deviation for different measurements with different arm speeds are shown in [Figure 4]. By increasing the arm speed, the maximum error also increases. The measurements with delay have introduced smaller errors compared to the measurements at 50 mm/s. Clearly the measurements at 1 mm/s arm speed have the best reproducibility in this set of measurements. Similar to the previous case, the measurements with 50 mm/s of arm speed have the largest error regardless of having delay or not. The results of comparisons are shown in [Figure 5]. The parameter Diff(%) has values larger than 1% for all cases except at 5 mm/s speed. In that case, for distances about 50 mm from the center, the discrepancy is fairly low. However, as the amount of collected charge decreases, the discrepancy increases. Waves in the water are unavoidable. ,, Solutions to improve the accuracy of dosimetric measurements, as was shown in results section, are 1) to set a low speed for the arm movement and 2) to extend the time between consequent dose profile measurements to a few minutes. The moving arm in large water tanks can have an impact on dosimetry. It was found that the surface waves can cause errors as large as 5% in the measurements. The most accurate measurements are obtained with arm speeds of 1-5 mm/s. In general, the measurements that are started after damping the waves are more accurate. However, at the higher speeds, errors of up to 5% occurred even after wave damping. It was shown that, because of the step moving arms, the water surface waves can have a transient phase and a steady phase. In the transient phase, which is caused by initial movement of the arms, the errors in dose measurements are as large as 5%. 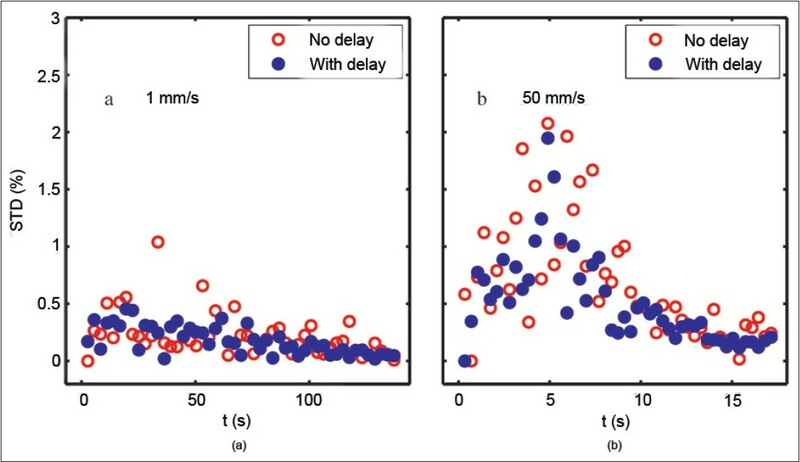 The transient phase is followed by a steady phase that causes smaller errors in dose measurements. The steady phase indicates that the water waves are unavoidable, and they always exist during the dose measurements. Similar experiments under different conditions, such as with 6 MeV beams, have led to similar results. The author would like to thank Dr. James Rodgers RadAmerica and Mr. Steven de Boer from Roswell Park Cancer Institute, Buffalo, NY for fruitful discussions on the results. 1. Das IJ, Cheng CW, Watts RJ, Ahnesjö A, Gibbons J, Li XA, et al. Accelerator beam data commissioning equipment and procedures: Report of the TG-106 of the Therapy Physics Committee of the AAPM. Med Phys 2008;35:4186-215. 2. Khan F. The physics of radiation therapy. Philadelphia: Lippincott Williams and Wilkins; 2003. 3. Van Dyk J, Barnett RB, Cygler JE, Shragge PC. Commissioning and quality assurance of treatment planning computers. Int J Radiat Oncol Biol Phys 1993;26:261-73. 6. Ibrahim R, Pilipchuk V, Ikeda, T. Recent advances in liquid sloshing dynamics. Appl Mech Rev 2001;54:133-200. 7. Faltinsen O, Rognebakke O, Lukovsky I, Timokha A. Multidimensional modal analysis of nonlinear sloshing in a rectangular tank with finite water depth. J Fluid Mech 2000;407:201-34. 8. Hill D. Transient and steady-state amplitudes of forced waves in rectangular basins. Phys Fluids 2003;15:1576-788.